Cannon Beach is a contemporary 10"x14" Watercolor on 140 lb. Arches Cold Press Paper. (See the "Wall Preview" option below the print size tab, then explore your designer wall color with the art). This watercolor is one of 3 I did as demonstrations of one of my favorite places on earth. It was such a thrill to walk in the fog up to that beckoning rock, like walking into a portal, into which the rock invites you to see the myriad forms of life clinging to it's side. (See the "Wall Preview" option below the print size tab, then explore your designer wall color with the art). Cannon Beach is a contemporary 10" X 14" Watercolor on 140 lb. Arches Cold Press Paper. (I recommend printing on Fine Art Paper. See the "Wall Preview" option below the print size tab, then explore your designer wall color with the art). 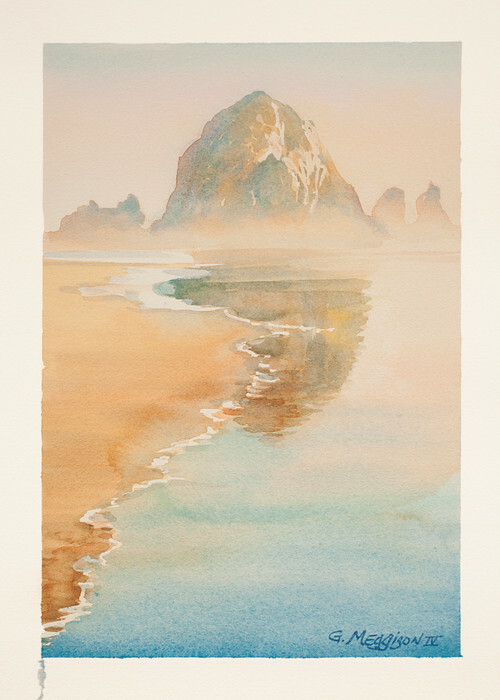 This watercolor is one of 3 I did as demonstrations of one of my favorite places on earth. It was such a thrill to walk in the fog up to that beckoning rock, like walking into a portal, into which the rock invites you to see the myriad forms of life clinging to it's side. (I recommend printing on Fine Art Paper. See the "Wall Preview" option below the print size tab, then explore your designer wall color with the art).